Driving a vehicle with misaligned wheels can lead to costly consequences, even potential safety issues affecting your car’s steering and suspension. To keep your BMW, Lexus, Land Rover, Porsche, Mercedes-Benz, Maserati, or other fine foreign car functioning properly, you need to have your wheels properly aligned. Have your car serviced at a quality auto shop, where you can be assured of error-free alignment at a reasonable cost. 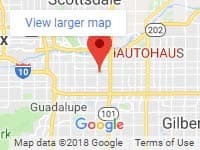 iAUTOHAUS BOSCH Authorized Service Facility has been providing Arizona fine-car buyers with the region’s best auto services for more than 20 years. Our ASE-certified technicians take pride in our top-quality workmanship, backed up by the industry’s best guarantee. iAUTOHAUS uses the premier Hunter-HawkEye system for wheel alignment services. Schedule your routine wheel alignment service at least 1-2 times a year, or every 12,000 miles. If you are concerned that your car’s wheels may have been jolted out of alignment by hitting a hole on a road or driving on unstable terrain, call our alignment specialists right away to have a realignment. Schedule wheel alignment services in Arizona with iAUTOHAUS today! Wheel alignment (sometimes called “tire alignment”) is the adjustment of the parts of a vehicle’s suspension system, to set the wheels and tires at optimum angles to facilitate the best possible handling while driving, minimize tire wear, and improve performance. What are the Benefits of a Tire Alignment? Allows for a smoother driving experience. Reduces expensive repairs of suspension and steering parts due to uneven or premature wear. Helps avoid excessive wear of tires that leads to needing premature replacement. Steering Pulling Right or Left — The vehicle pulls to one side or the other, requiring the driver to compensate by maintaining correction of the pulling while driving. Uneven Tire Wear ­— The outer or inner surface area of the tire that makes road contact is wearing faster than the rest of that part of the tire. Often, the uneven wear occurs on only one or two tires. Steering Wheel is Positioned Off-Center — While driving straight, the steering wheel is off to the right or left of the 12 o’clock position. Shaking Steering Wheel — The steering wheel may pulsate or shake, even on smooth roads, possibly causing the shaking to travel through the chassis and be felt through the seat. Should I Get a Front or 4-Wheel Alignment? Depending on your vehicle type, rear wheel adjustments may be possible. At our auto shop, there is not a significant difference between prices for front only or all four-wheel alignment service. Front Wheel Alignment — Many vehicle models don’t have adjustable rear wheels. If yours does not, then you’ll need only a front wheel alignment. Four Wheel Alignment — If adjustments for both front and rear wheel alignment are possible on your vehicle, then you should have a 4-wheel alignment. On average, a wheel alignment takes around an hour. Although this is often considered a service that you can just drop in to have done, many auto service shops recommend scheduling an appointment. Especially in shops with just one alignment rack, or with very limited staff, waiting in line can cause your stay at the shop to be much longer than an hour. There’s no standard length of time that a vehicle should be expected to remain in alignment. It is generally recommended that you have your car aligned once or twice each year. However, if you drive on rough roads, or bump into curbs, you should have a more frequent re-alignment. What sets iAUTOHAUS apart is our unique combination of exceptional sales and service value. We offer Arizona’s most exclusive selection of pre-owned luxury European automobiles, all at attractive prices. Our spectacular 25,000 ft. indoor showroom features Porsche, BMW, Mercedez-Benz, Porsche, and other high-end foreign models. New inventory arrives every week. Don’t settle for less than the best service and maintenance of your fine European-made automobile. iAUTOHAUS’s unparalleled quality of service facility helps to ensure that your vehicle stays in excellent operating condition. 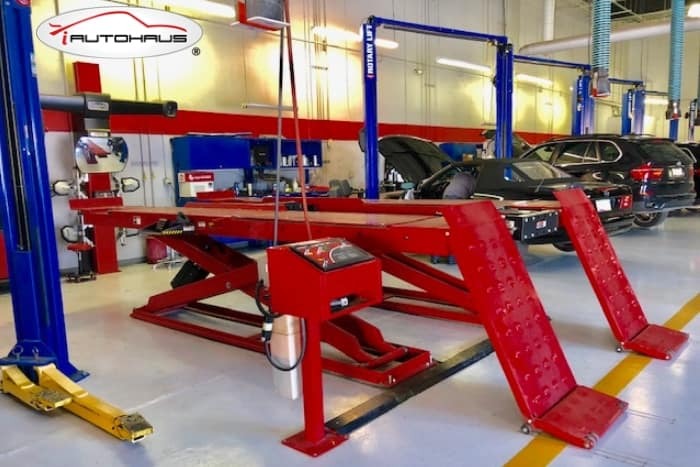 If you’re searching for “wheel alignment near me”, Call iAUTOHAUS BOSCH Authorized Service Facility in Tempe, Arizona at (480) 317-0783, for more information about our affordable wheel alignment costs, or to schedule an appointment for service. Be sure to see our service specials page to check out our latest offers!